Maia Morgan, the winner of Plaza College’s 2019 National Court Reporting Association Student Speed Competition. 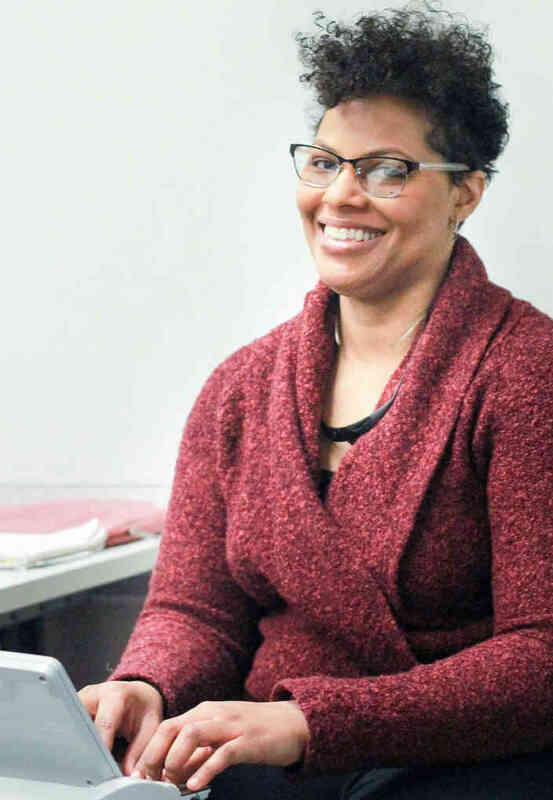 Mount Hope resident Maia Morgan from the Bronx is one of twelve winners in Plaza College’s 2019 National Court Reporting Association Student Speed Competition. With over 100 students racing against the clock and racing against each other to see who was the fastest and most accurate court reporter in honor of National Court Reporting and Capturing Week, Morgan was the best. Morgan and her peers were to transcribe using a stenotype. It is a specialized shorthand machine which interfaces with a customized laptop, and take dictation at various speeds as they train to become professional court reporters. Morgan has proven that she is good enough to be hired by CourtScribes, which houses the best in the business. A stenotype keyboard has fewer keys than a conventional alphanumeric keyboard. It is usually used for court reporting purposes. Multiple keys are pressed simultaneously to spell out whole syllables, words, and phrases with a single hand motion. Since the keyboard does not contain all the letters of the English alphabet, letter combinations are substituted for the missing characters. “Using the stenotype machine is almost like learning another language,” Morgan expressed. Morgan types at an impressive 120 words per minute with 96% accuracy. To graduate, she will have to increase her speed to 225 words per minute. Morgan aspires to one day work as a stenographer in either the supreme or civil court. She finds being a court reporter an exciting career option and encourages everyone to give it a try. “Maintaining the required speed and trying not to think too hard while typing are challenges, but they can be overcome through practice and patience,” Morgan said. She said making one’s fingers nimble is key to increasing typing speed. Morgan suggested learning to play an instrument such as a piano or guitar to establish muscle memory. According to Karen Santucci, Plaza College Court Reporting chairwoman and NYS Court Reporters Association vice president, stenographers are very vital. They keep records for legal hearings and trials; grand juries; depositions; government meetings and hearings at local, state and federal levels; as well as TV closed captioning and services for the hearing impaired. “Our role is crucial because we record and preserve the accurate accounts of trials, depositions, grand juries and other crucial aspects of the legal system which are essential to ensuring the fair administration of justice,” Santucci explained. Court reporters’ records ensure fair trials and serve as the basis for appeals and other cornerstones of the entire American legal process. These professionals (court reporters), 90% of whom are women, are responsible for preserving the historical record of legal proceedings and serve as crucial documentarians ensuring reliability. Court reporters’ salaries can top $100,000 a year. If you have trained to be a court reporter or you are in need of one, go to the website courtscribes.com to see how you can become a part of the team, or contact to hire a reporter. Plaza College is NYC’s sole court stenographer program, with 200 students currently enrolled. Plaza College has a 70% graduation rate across all of their offered programs and more specifically a 73% retention rate within the court reporting program. A true sign of a successful program putting out successful reporters.